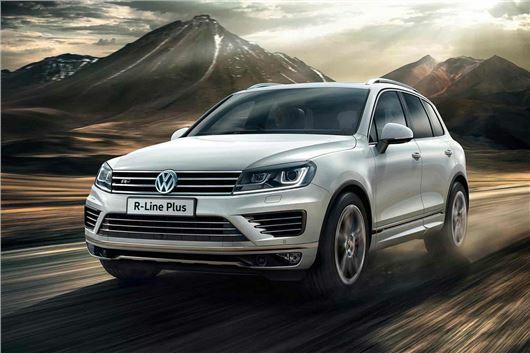 Volkswagen is attempting to push the new Touareg further upmarket with the addition of a new trim level called R-Line Plus, which provides a kitchen sink level specification for a suitably lofty price of £48,095. It’s available to order now. Available with both the 204PS and 262PS versions of the 3.0-litre TDI V6 diesel engine (both equipped with an eight-speed automatic), the R-Line Plus comes with MTV-spec 21-inch wheels and a bird’s-eye parking camera system. Leather upholstery is standard, as is piano black interior trim, while the seats are electrically adjustable 14 ways. The body kit is the same as the R-Line’s, although Volkswagen reckons the additional equipment of the Plus is worth £3255 over the R-Line, while the premium is just £1660. Other standard kit includes 4Motion four-wheel drive, sports suspension, bi-xenon headlamps, a panoramic sunroof, heated steering wheel and an electric tailgate. Fuel economy is pegged at a 42.8mpg average for both the 204PS and 262PS versions although, strangely, CO2 emissions are not the same, with a respective 173g/km and 174g/km.